Back to school with Scoolio-Von-Hoolio and OfficeMax giveaway. Get Organized Today! Last week I was invited to participate in a “Get Organized for Back-to-School” webcast & twitter chat and it was a blast. First off I love twitter chats of any kind so I was stoked to participate, I was also interested in getting some organizational tips because our “office” is anything but organized. The idea of the webcast was that Peter Walsh and several panelists would present organizational tips for the home, for kids and for the classroom while allowing viewers to submit questions via twitter that the panelists would answer. Just before the webcast we received this surprise box of adorable cupcake themed school supplies courtesy of OfficeMax. 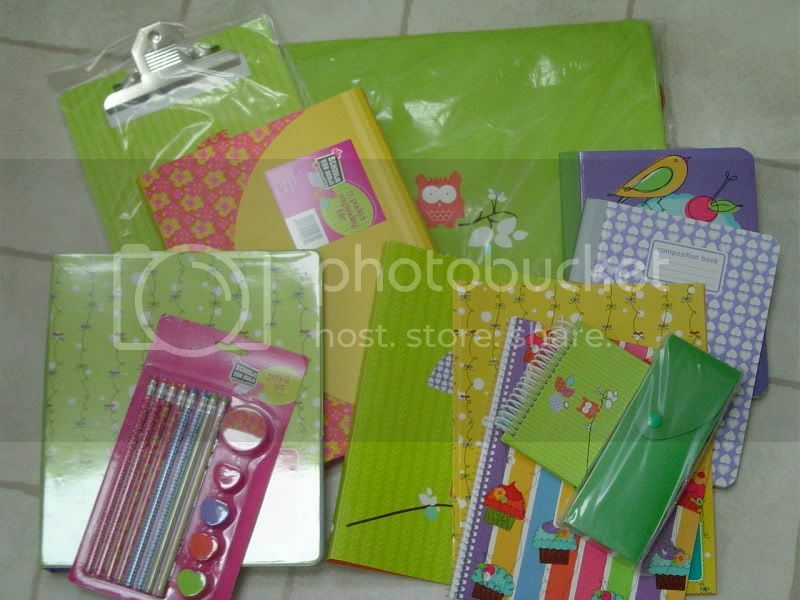 The school supplies are adorable and were a fun gift, unfortunately we can’t really use them. I decided it would be fun to host a giveaway here on the blog so I could pass these cute school supplies on to a lucky reader who can put them to good use. So here are the giveaway details: This giveaway is now closed. To enter: Leave a comment on this post with your best organizational tip (this is a mandatory step). Once you have commented with your organizational tip you can make the following optional extra entries. For the extra entries be sure to use the form to enter each of your extra entries or they wont count. Comment on any of my other posts (besides this one), tell me which one. Unlimited entries. Follow me on twitter, leave me your username. 1 extra entry. Tweet the giveaway, leave me the link to your tweet. 1 extra entry per day. Follow this blog publicly via friend connect, leave me your username. 1 extra entry. Follow this blog on facebook, leave me your facebook name. 1 extra entry. Use another media sharing tool (stumble, technorati, digg etc), tell me what you did to share. 1 extra entry per sharing tool. Eligibility: This contest is open to those with a US mailing address (unless you are willing to pay for shipping costs to ship out of the USA) and will close on August 31st 2009 at midnight. The winner will be announced here on the blog. Be sure to subscribe so you don’t miss the announcement of the contest winner! The winner will have 72 hours following the announcement to contact me and claim their winnings. If the winner fails to contact me within the 72 hour period they forfeit winnings and another winner will be selected and posted here on the blog. Random.org will be used to draw the winner. My best organizational tip is to follow FLYLady’s routines from FLYLady.net. .-= Jayne @ Misplaced City Girl´s last blog ..SIRJJ Organics Review & Giveaway ends 8/22 =-. I wish I was organized. I just tend to make sure that my desk area is semi-neat. My piles my look messy, but I know where everything is. .-= Becky´s last blog ..Work in Progress =-. Somehow I just erased my last comment- so here is the shortened version. I made some 2 pocket flannel bags for my 2 year old daughters clothes. I call them magic bags and she gets to choose which pocket she wants to pick her cloths from. It eliminates arguments and she thinks it is cool. I have a rule about our mail, it only leaves your hand if it is shredded/put in trash/filed/put in the important pocket (we have a shoe organizer on the back of our coat closet with labeled pockets- oh and some shoes!!). We have a basket near the door for shoes that we wear everyday. I menu plan 2 weeks ahead, use the crockpot often, and freeze alot. I pick up every evening, no matter if I know it will be promptly dug out the next morning. We are back to school in a couple weeks- that includes me as I am a teacher. I dread it, but as a teacher I am determined to stay organized this year!! .-= Carrie´s last blog ..Growing up =-. I usually lay out my daughter’s clothes then night before and stick to a strict schedule in the morning to make sure everything gets done in time. I also have several totes for my girls toys according to size so they know which toys go where. .-= Eloise C´s last blog ..Etc =-. My best tip is to get everyone involved. It is too hard to try to do it all by yourself. Don’t keep your systems to yourself. Everyone in the house should know what goes where so there are no excuses and the burden is not all on you. I am not a very organized person. But what helps me is using bulletin boards-I have one in the kitchen and by our computers. My daughter has one in her bedroom. My best tip is to get rid of stuff. Seriously. As soon as I notice the kids aren’t playing with something anymore, or something doesn’t fit anymore, it goes in the charity bag. It’s hard enough to organize the stuff you really want and love, but even harder when there’s lots of “junk” in the way. .-= lisa´s last blog ..In over my head? =-. My tip is – a place for everything and everything in its place.